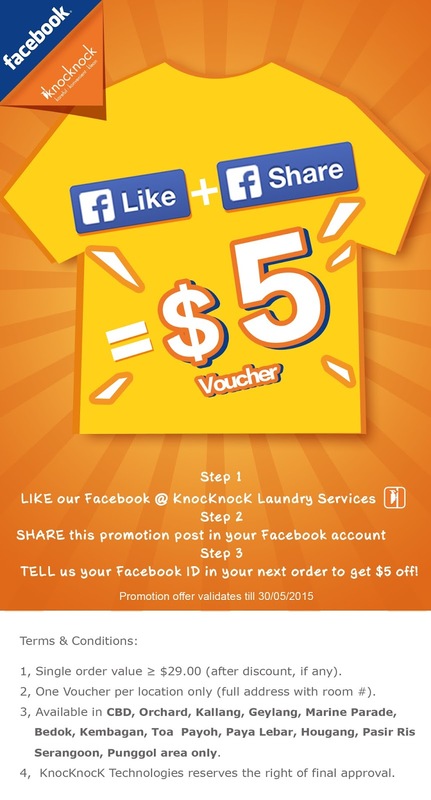 KnocKnocK Laundry Services in Singapore! Please email us your full name, mobile phone number and top-up amount to woodpecker@knocknockapp.com with your payment proof (if any). Upon verification, we will credit the rewarded credits into your KnocKnocK account in 3 wording days. You can top up directly in the App via Paypal account, credit card, etc. or. Cash, Cheque or Bank transfer are also acceptable. One user ID (User Address) can only be eligible to the above offer once. This offer does not validate in conjunction with other top up promotional offers and discounts. This offer validates till 31/12/2015. In any case of dispute, the decision of KnocKnocK shall be final. Living Room Items Promotion. Validates till 17th Nov.
Based in Singapore, KnocKnocK (full name: KnocKnocK Technologies Asia Pte. Ltd.) is the only laundry and dry cleaning app to offer door-to-door coverage across the country. You will get your laundry collected, cleaned and delivered at a time and place you choose. KnocKnocK is the most economical and convenient way to do your dry cleaning and laundry. Using our mobile phone app, you are able to request pickup for any time between 8 AM and 10PM, any day of the week. When your clothes are ready, we’ll send you a notification in the app, and you can schedule an immediate delivery or schedule one at a time that’s convenient for you. We are currently focus on Central and East Area. Not in your area yet? Please stay with us on Facebook @ KnocKnocK Laundry Services to get updated. Or, send us your contact information so that we can notify you when we expand to your area. we’re constantly expanding our coverage. We are looking forward to serving you! How long it takes to clean? 4-5 working days for normal laundry items such as shirts, dress, bed sheets etc. It might take longer for those heavy items such as curtains, carpets and sofa covers. Where do you actually take my clothes? Your clothes will be taken care by the best-in-town professional laundry specialists with our partner factories across the country. We believe that laundry and dry-cleaning services must be safe and hygienic, which requires special skills and techniques. Our pledge is to work in partnership only with facilities and professionals that prioritize quality, safety and integrity. So we will not send your clothes to any facility or personnel that quality and safety cannot be trusted and controlled. We ensure that all of our facilities across the country meet the strictest industry standards in taking care of your clothing. How do I get my clothes delivered? Once cleaning process completed in 4-5 working days (for normal items) or 5-7 working days (for the heavy items), you will receive a push-up note in your KnocKnocK App. Upon opening up the app, you’ll notice that your order will be listed on the “My Orders” screen. Then you can choose those available time slots for delivery at your preference. What should I do if I m having technical/App issues? Our engineers are hard at work improving the app and testing for bugs, but we aren’t perfect. If you are experiencing issues with the app, we would love to hear from you via phone + 65 6719 2357 or email (woodpecker@knocknockapp.com). How can you maintain your quality while offer the most competitive pricing in town? Well, first of all, we are offering you the “whole sale” factory price instead of “retail” prices, that’s how our prices are most competitive. Secondly, the best-in-town laundry specialists as well as laundry facilities from our selective partner laundry factories will take care of your clothes properly and carefully. Finally, on operation side, by leveraging the modern technologies we are able to cut down our operation costs by our operation system driven by technologies such as Location Based Services, Big Data Analytical capabilities. We pickup and deliver between 9 a.m.- 10 p.m., every day; however, we will take break on Public Holidays. What type of device must I have to use KnocKnocK App? You can use any iPhone and Android phone models, although the app is optimized for the latest versions. We will inspect each dry clean item both before and after cleaning to look for minor issues like broken or missing buttons and will do our best to fix these up for you. What about that pesky stain I cannot seem to remove? What is load wash (wash & fold)? Why is there a minimum for load wash? Through load wash, your clothing will be washed, dried, and then returned folded. Please do NOT mix your items with different colors (light color or dark in general), we encourage you to put them into separated 2 orders with minimum of 3 kg per order because we will process the order one by one. What is dry cleaning and how do I know if an item is meant to be dry cleaned? Ok, then what is normal laundry? Laundering is a process reserved for those cotton items such as shirts. Laundered items are washed and then steam pressed and hung for delivery. Just create an account via web at www.KnocKnocKapp.com or download our app for iPhone or Android. You’ll be asked to connect with Facebook or enter your email address, input your address information and setup your payment options , and then continue to place your order. How do I schedule my first order? Once you complete your setup, you’ll see Start New Orders button, click and fill in your address, date and time slot you preferred, then NEXT. You will either choose the items one by one or simply click PLACE ORDER directly, our woodpeckers will then check your items for you when they come. How should I prepare for my first pick-up? We will provide you with free KnocKnocK bags to use and you will need an extra 2-3 minutes for your first pick-up to transfer your garments into the KnocKnocK bag(s). Please place your dry cleaning in the garment bag, and your wash & fold in the laundry bag. How do I know if my order has been submitted successfully and accepted? What should I expect once my first order has been placed? You’ve selected a pick up/drop off time, separated your clothing, and are wondering what is next; Well, its super simple. You will receive a series of text alerts before your Woodpecker arrives for your scheduled pickup time slot: an hour before, when your Woodpecker is en route, and once he/she has arrived. Your Woodpecker will come equipped with bags for you to place your Wash & Fold items in and a bag for all your dry clean/laundered items. Once you’ve handed over your dirty duds to your Woodpecker, you’ll get a tasty treat to enjoy! Change of plans? Not to worry! After you’ve placed an order, you can click into the Order Details and change the pick up or drop off times. You can also cancel the order at the bottom of the order status circle. However, we encourage you to change your time at least 1 hour before the appointment. Also, each order can only allow to be changed once. Can I have Woodpecker (our staff) come the same time every few weeks? Yes! That’s what we fondly refer to as a Recurring Order. While placing your next order, you have the option to repeat every week, every other week, every 3 weeks, or every 4 weeks. Just select your desired time and day for pick up and drop off. It’s as easy as that. What if Woodpecker is running behind schedule? We do our absolute best to honor the time slot you selected, but sometimes there are unexpected delays beyond our control (traffic, weather, car trouble). We also know how busy you are, so if we’re running behind and you just can’t wait, let us know, and we’re happy to reschedule your order free of charge. Please do not place personal items in laundry bags. This includes, but is not limited to: wooden hangers, non-KnocKnocK laundry bags, wallets, keys, phones, computer equipment, etc. During the cleaning process, these items may be misplaced and/or damaged. How do I tell KnocKnocK about specific requests for my order? You will be able to indicate your detergent preference and your men’s shirt care preference (if applicable) ahead of time through the preference screen. If you have any additional special requests, you may add them into the special notes section or let your Woodpecker know. We know how important your clothing is to you, so we do our best to honor all customer requests. Can you pickup/drop-off my dry cleaning even if I’m not at home? Yes, we can. Please leave any special instructions about your order beforehand. You may indicate in the preference screen whether your Woodpecker is allowed to leave your clean clothing at the door in the event that you are not at home during your selected drop off time. Can I use KnocKnocK if I have a doorman? Of course you can! In fact, you actually have the option to have us interact solely with your doorman or to treat you just like a non doorman building and come directly to your apartment. If you’d like us to interact with your doorman, be sure to indicate this in Special Instructions. When you want us to pick something up, just leave it at your doorman in your KnocKnocK bag, and request a pickup via the KnocKnocK app. Once your order is ready for delivery, just ask for a delivery and we’ll just drop it right back to your doorman and notify you that it’s there. On your way in, just grab it and go! All laundry will be washed with cold to warm water. All clothes will be dried in high heat, unless otherwise specified. If you need clothes washed or dried in any other setting, please specify this in the Special Instructions section in the app. In addition, please make sure that all garments are washed according to the instructions on the label, and that these instructions match your special instructions. How much does KnocKnocK cost? Here at KnocKnocK, we’re big on transparency. We offer 30% off against market standard pricing, and we post all our prices here, It is clean and NETT – NO GST or extra service charge. You know exactly what you will be paying for. Take note that there are additional surcharges for certain materials such as silk, cashmere, and wool. Visit our estimator to estimate the total cost of your next order! KnocKnocK Credits: Upon top-up into your KnocKnocK account, you can pay directly via your credits available in your accounts. You can enjoy exclusive membership discounted pricing as well as special promotion programs. Credit Cards via PayPal: Its simple and safe to do online payment via PayPal. Click Here (https://www.paypal.com/us/signup/account)to sign up for Paypal if you don’t have one yet. Cash: Cash is also acceptable. Pay cash to our Woodpecker and get confirmation of receiving payment from them via the App. KnocKnocK Voucher: You can also use your available voucher in your account to offset your payment. Is there any GST or any extra service charge applied? NO. 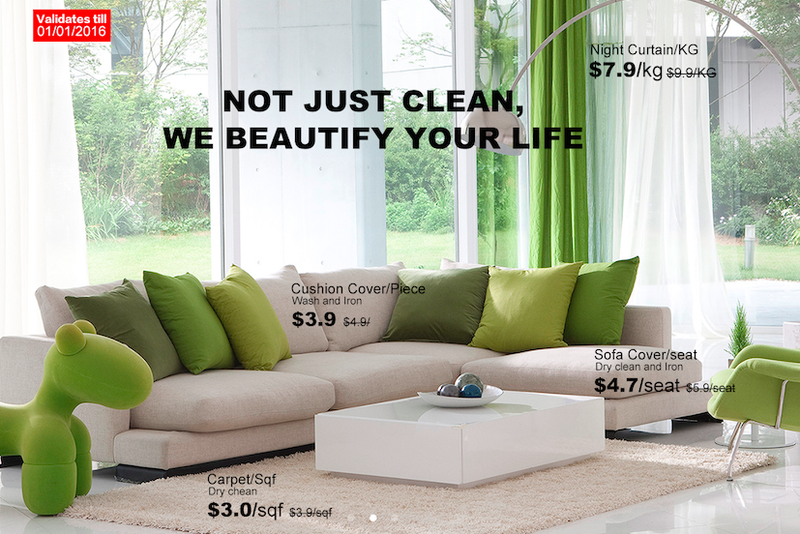 We post all our prices here, It is clean and NETT – NO GST or extra service charge. You know exactly what you will be paying for. But take note that there are additional surcharges for certain materials such as silk, cashmere, and wool. Visit our estimator to estimate the total cost of your next order! Why is the price of cleaning my garment different than the price list? How do I see if my voucher is applied? Are there certain materials you cannot process? We can handle almost all those items we can see and we are using including those special material products such as leather, silk etc. if you have special items need to be clean but you are not sure, you can always send your query to us at woodpecker@KnocKnocKapp.com. Can I keep the awesome KnocKnocK Laundry bags? Yep, you sure do! Every year, approximately 500 million plastic dry cleaning bags head straight for the landfills. KnocKnocK wants to help drive that number down by providing customers with reusable laundry & dry cleaning bags!